This is the seventeenth year of a New York Asian Film Festival that has grown a lot and now is at two venues, Lincoln Center and Chelsea, has become one of the notable celebrations of Asian films around the world. This year the NYAFF included an impressive 58 films, nearly all features, a few documentaries. It is only my second year of it and the honeymoon is scarcely over. I can see the genres often dominated, lots of gangsters and martial arts battles: but it's also impressive what original, sometimes almost unrecognizable, spins individual filmmakers put on them. And it remains dazzling how varied a world this "Asia" is as represented here: Japan, China, Taiwan, Hong Kong, Malaysia, the Philippines, Thailand, South Korea and Indonesia. 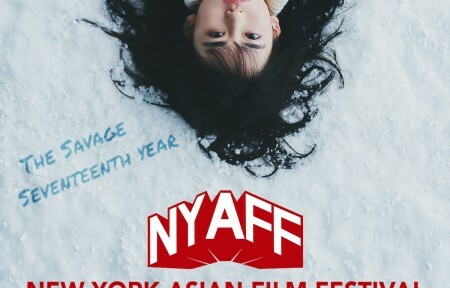 The NYAFF ended yesterday 15 July 2018 and I don't know if I'll provide any more reviews, though that wasn't all I saw. We got zombies, yakuza, samurai, murderers, druggies, young obsessive lovers and teen bullies in manga from Japan, crooked real estate dealers, warriors, lovers, teenagers, rappers, politicians, cops, and robbers from South Korea, China, Taiwan and Hong Kong and Malaysia and Thailand and Indonesia. I liked much of what I have reviewed. But I'll highlight some below that stand out from the others and show what riches and surprises Asia has to offer. The Looming Storm (Doug Yue) - China. A humorous, or make that clueless, chap who's in charge of security at a (huge, gloomy, doomed) China factory in 1997 imagines himself involved in the local investigation of a serial killer. First timer Yue approaches a series of themes and genres in an original way, all the time retaining the gloomy, rain-soaked mise-en-scène. One Cut of the Dead/Kamera o tomeru no! (Shin'ichirô Ueda 2017)- Japan. The filmmakers are constantly at several removes from their zombie theme in three different "facets" presented as live film for TV, an about-the-filmmakers, and a making-of. It's funny but ingenious and informative. And for zombie fans it's still pleasingly gorily gruesome in spite of all the self-reflectiveness - with the shock of the fakers encountering the real thing right in their faces. Within the layers of the "real" perhaps there is the real. Respeto (Treb Monteras 2017) - Philippines. A young would-be rapper confronts his limitations and meets a learned elder and the new regime seems to be reliving the worst excesses of the old one. Every frame almost of this exudes a sense of caring about its themes, the fate of the nation, and its recent history. You have the feeling that in the Philippines they care more and there's more immediately at stake. This shows even also in the violent, skillfully over-the-top genre films of Erik Matti featured this year. Hit the Night (Geong Ga-young) - Korea. I did not like this, but its dogged pursuit of themes of drinking, seduction, and nonstop conversation found differently treated by Hong Sang-soo, but this time by a woman, is worthy of note. I'm sure as a man I'm not supposed to enjoy it. The Empty Hands (Chapman To) - Hong Kong. "One of the strangest martial arts dramas ever made", said Hollywood Reporter. This drolly weaves martial arts into a story about paternal oppression, female liberation, inheritance, and real estate. "Drolly" is what I meant. Witty editing and witty set design make this lively and visceral even if it may be tongue in cheek. None of these films are quite what they seem. That's the beauty of it. The Age of Blood/Yeoekmo - banranui sidae (Kim Hong-sun 2018) - Korea. It is fun just seeing how the filmmakers take a cute teen idol and mold him into a gnarly historical martial arts hero. They pull it off, and he's unrecognizable! The Scythian Lamb (Daihachi Yoshida 2017) - Japan. What in real estate is "location, location, location," in movies is "premise, premise, premise." The premise here, six convicted murderers get relocated to the same small rural town, is impossible to go wrong with if you just don't mess it up, and they don't. The air is full of promise, and threat, like in Chabrol. Sad Beauty (Bongkod Bencharongkul 2018) - Thailand. Two pretty women have to get rid of a corpse in this film, but that is only the beginning, and this is also a medical melodrama and the story of a passionate friendship of two women that somehow the more narcissistic of the two has trouble living up to. The writer-producer-director, though an experienced actress and a star, had to fight to get this made. It shifts gears repeatedly and that's fully intentional. This has the kind of excitingly unparsable quality that marked the early Wong Kar-wai.